I wouldn’t say I’m accident prone….but I sure have a lot of scars! In 5th grade, I was playing tag with my friend. I thought I was slick and tried to outrun her by swinging from a low branch of a eucalyptus tree in my grandparent’s backyard. As I swung sharply around the tree my shin rammed and stuck into a rototiller blade. Yeah. That scar isn’t going anywhere. In 7th grade, I crashed and ate it while rollerblading down a very steep driveway. I fell on my knees and got some nice scars out of that experience. That same year I tripped and fell on a piece of glass that went through the back of my hand and I still have chicken pock scars near my left eye. Of course, I have the normal scars of growing up that have forgotten stories. So yeah, I’ve got quite a few scars, and they never really seemed to bother me. I always thought that were kinda cool… until I started getting acne. That’s when I got the first scar I really felt self-conscious about…. right in the middle of my right cheek. So how do we go about remedying scars like this? Simple DIY homemade remedies of course! Here are some recipes I’ve used with great results in reducing the appearance of scars. They have certainly helped my war wounds, battle scars, and clumsy encounters. Never underestimate the power of fruit and vegetable juice and its ability to heal. This recipe is fast and simple to make and is best for scars that are fresh but healed. You won’t want to put this on any type of open wound because that would sting like crazy. Just sayin! • juice one of these ingredients (you can even mix equal parts each for a super concoction!) and use a cotton ball to soak it up. The citric acid in the lemon and tomato will lighten and brighten hyperpigmentation, reduce redness, and slough off dead skin cells. 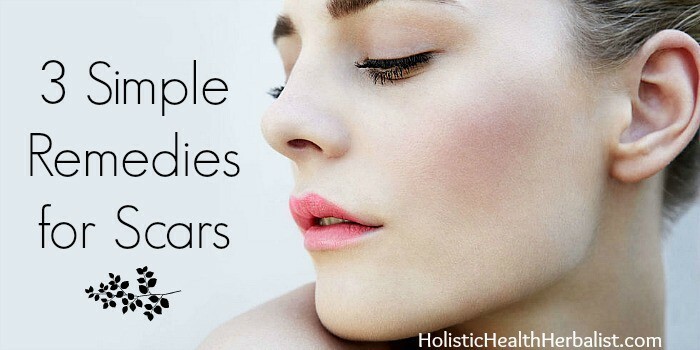 In time, your scars will be much smoother and become less noticeable… it’s really one of the best remedies for scars! Use this remedy every day for normal skin types and only every few days for those with sensitive skin. Be sure to protect yourself from the sun the next day after treatment. All you have to do is put these in a nice little dropper bottle and shake it well for use. I usually use 2-3 drops depending on the size of the scar. DMAE is a natural amino acid that repairs and nourishes the skin. Using it in a facial oil will help pull its nourishing qualities deep within the skin the help heal and diminish scars. Using this scar remedy daily will show improvement almost immediately. This remedy is really great for fresh scars and has a bit more staying power than the Healing Oil. You can use this lovely salve anywhere from stretch marks to scars. The Vitamin E oil is super nourishing and moisturizing, pulling scar-healing properties deep into the skin. The lavender essential oil is known for its healing abilities too, so it’s perfect for this scar healing salve. Use it twice per day for best results during healing. I had knee replacement surgery a month ago. I was looking for a salve to begin putting on the incision as soon as it was healed and there were no scabs. I made number 3 today. The beeswax made it so hard to smooth onto my skin, so I made it over with coconut oil in place of beeswax. I am now waiting for it to solidify. I hope it works this way! I also added a few drops of Helichrysum essential oil. I will let you know how it worked after I have given it time to work :)! coconut oil would not work as a replacement for beeswax; just use less beeswax instead; 15% would solidify oils in a nice manner. Do I just leave the Scar Removal Salve on for a certain period of time directly on the scars? I like to leave it on as much as possible. If you put on just a dab, it won’t look too greasy. I recommend putting the salve on once in the morning and once at night until you see the scar begin to smooth out at it heals. Hope this helps! Will any of these work on stretch marks? I haven’t used these for stretch marks before, but I would certainly consider trying them out! The are very healing and smoothing for the skin, so I imagine they are also good for improving the appearance of stretch marks.